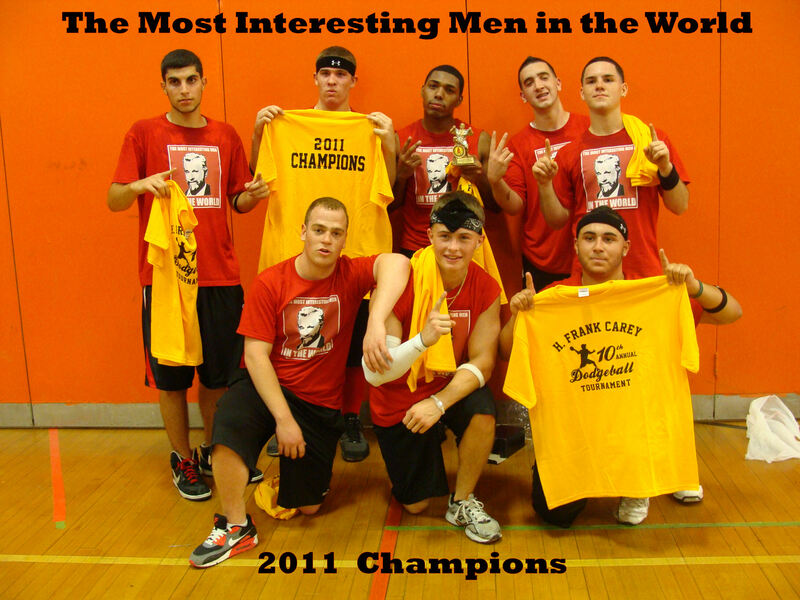 In what could easily be called the most wide open tournament in H. Frank Carey Dodgeball history, the Most Interesting Men in the World, led by MVP David Cedeno, defeated The Long Lost Sleeves of Anthony Romanello three games to one to earn bragging rights for the 2011 school year. Coming in at 7-1 odds, the 'Men' knocked off The Benchwarmers, John and the Biddie Beez, Licata and the 6 Boes and finally Long Sleeves as they took the hard road to the title. No freebies here as David "Sun's Out Guns out" Cedeno, Sonny "Sinker Ball" Catanese, Ryan "Mr. DJ" Karl, Joe "Babs" Babyer, Mike "Red" Masci, Dan "A Lot 'O" Motto, Mike "Rockin'" Reister and Rob "Altunernate" Altun all contributed to a well balanced team victory. Congratulations...and thanks for spinning those tunes to keep the crowd interested!!! Now onto the good stuff...The One Day Tournament appeared to be a success and may be revisited next year. Best Uniforms-Rumplestromskins,The Most Interesting Men in the World, The Benchwarmers and Recess. Best Play of the Tournament-Craig Samson's One against Five Pin Hit vs Noah's Ark. 2012 Move Not Allowed EVER again...the Frank Klimzack Flip...Save it for Gymnastics Class! Best Moment of the Tournament-The 10th Consecutive Year Carey Students Showed How Awesome They Can Be By Behaving Perfectly!!!!!!!! Thanks from Mr. Hedquist. Friends with Benefits over The Long Lost Sleeves of A.R. In an attempt to make the Tournament as fair as possible. A Play-In Round has been added. It would be extremely UNFAIR for a team from a six team bracket to be in the Finals with just two wins. I am as always trying to give EVERY team a chance to play the same amount of games to Win the Championship. However, with 22 teams some juggling was necessary. Thank You for your understanding. Welcome to Dodgeball 2011! This year's tournament will be the 10th Annual to see who will claim H. Frank Carey bragging rights for another year. The current schedule has 22 teams vying for the Championship. The Tournament will be held on Monday June 13th ONLY-from 3:15PM-7:15PM. Now let's get down to business. Under no circumstances can the following things happen: 1) No Inappropriate Team Names-If you are not sure then ask Mr. Farina or myself. 2) Do NOT wear your Dodgeball Gameday Uniform during the school day--All Headbands, Hats, Bandanas, Etc. will be confiscated and you will become a distraction to the educational process. Worse off you will put this tournament in jeopardy of becoming extinct! 3) When you attend the two-day Tournament-Do NOT hang around or walk through the hallways-No getting books, or "I forgot something in my locker" nonsense. When the entire crowd leaves after the tournament you should exit the building and head home. 4) No foul language or inappropriate behavior will be tolerated on the court or in the stands. 5) Make sure you are attending all of your Review classes and extra study periods-budget your time properly. If there is a conflict with the tournament make arrangements so you go to the review courses in the morning. 6) Use common sense-you represent Carey HS and yourself. Behave, compete have fun but do the right thing (You all know what that is) and this tournament will continue in the future. If not then we may go by way of the dinosaur-Please don't ruin a good thing.